The weather has been all over the place, freezing cold and requiring a puffy jacket one day and gorgeous, sunny, and reminiscent of May the next. I know we are still a few days away from Spring’s official debut, but Daylight Savings is this weekend and losing an hour of precious beauty sleep always tends to throw people off, myself included. The constant change in weather also has the potential to mess with your complexion and your immune system. In order to fight against these natural occurrences, I’ve decided to launch a series for the remainder of March that will cover a variety of Chinese Herbs and their effect on the health of your skin. Recently, my clients have been asking me for more information about herbs that can help to heal your skin. In the past few months, medicinal herbs have come to be front and center in the wellness world. Though I’ve been using Chinese herbs to keep my skin clear and glowing since I was teenager, I’m glad that there has been a more recent increase in interest in using herbs to heal. Remember that beautiful skin starts from within, and regardless of how you take care of it on the outside, your skin requires internal nourishment as well. Finally, I’d like to preface this article by stating that I am not a doctor and that you should consult a medical professional before starting any new regimen. However, I find it beneficial to share herbal remedies that have helped me in the past. You know the saying, “An apple a day keeps the doctor away?” Well, there is a Chinese saying, “Three red dates a day keep you young forever.” These powerhouses, also known as Jujube, contain 70-80 times the Vitamin C content of grapes and apples. They also contain a ton of Vitamin A, Vitamin B1, Vitamin B2, protein, calcium, phosphorus, magnesium and iron. Red dates encourage the production of white blood cells, improving immunity and nourishing your blood. This also builds up yang Qi, which is the warm half of the yin-yang balance in the body. They have the power to strengthen the spleen and the stomach, replenish Qi, and calm the mind. Often used to stimulate poor circulation, this Vitamin C-rich herb helps to warm the body while reducing inflammation and decreasing puffiness. Ginger Root is a warming herb which specifically aids the lungs, the spleen, and the stomach. Goji Berries are also useful for anti-aging, containing Vitamins A, B1, B2, B5, B6, C and E, as well as loads of antioxidants and minerals. However, these powerhouse berries have been used in Ancient Chinese medicine for many years due to their ability to strengthen the kidneys and balance the body. 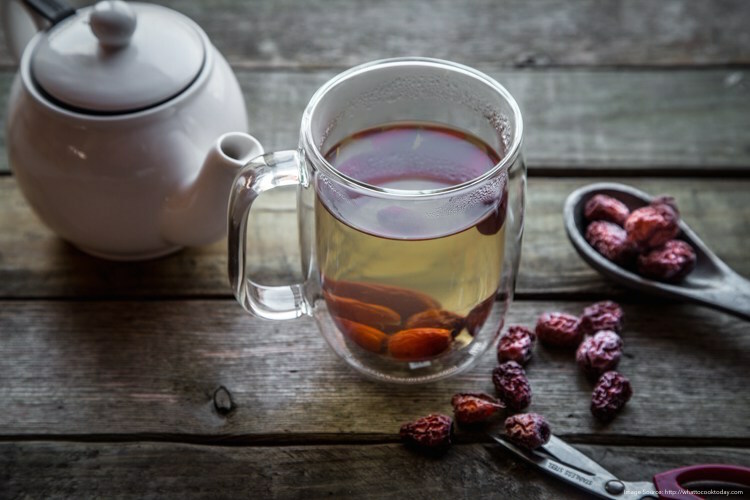 Goji Berries, also known as Gou Qi Zi, have come to be known as a superfood in America in recent years. Though you are probably familiar with some of these ingredients, I wanted to share a simple recipe with you that will allow you to reap the benefits of each of these powerful herbs at once. 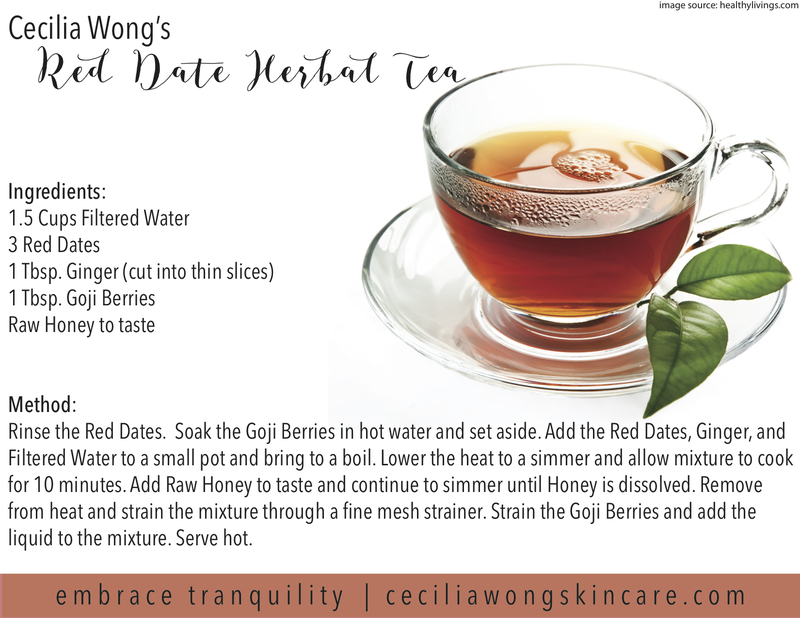 This tea has anti-aging properties and will help reduce inflammation and balance your entire body. During the Spring season, when the weather is changing so frequently, this is the perfect tonic to help reset and nourish your body, while also providing you with plenty of Vitamin C to increase your immunity. What do you think about using herbal remedies for your skin and body? Have you tried experimenting with any Chinese herbs? Let me know if try out my recipe and how it makes you glow from the inside out! I would like to thank you so much for reading and so generously sharing! It’s always great sharing these lovely tips with you all! P.S. Be sure to follow us on Instagram for more amazing skincare tips and tricks every single day!